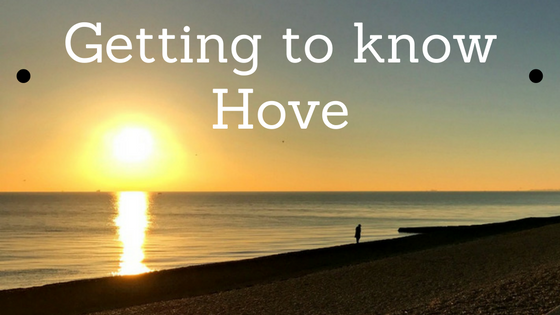 We have now been living in Hove for a month. During that time we’ve been getting out and about exploring the local area as much as we can. Before we decided to move from Surrey down to Brighton and Hove we hadn’t actually spent a lot of time down here. Now that might seem crazy and I guess it kind of is. But we just knew it was where we wanted to live. Having experienced both winter and summer down here prior to moving we knew what we were getting ourselves into. I pretty obsessed with the beach, but especially the brightly coloured beach huts. I would love to have own one, one day but for now I love taking photos of them. Even on grey, stormy days we’ve managed to get out. We live about a 15 minute walk from the seafront so we go down there quite a lot. In fact since we moved just over a month ago, I’ve had my most active month ever according to my phone. Most days I am walking 3-5 miles, usually along the seafront which is great. Clem is loving it too, every time we go down to the beach we always come home with a little stash of shells and pebbles. Summer is certainly going to be exciting. Bring on the bbqs and sunny days spent on the beach. I know the beaches will not be this quiet once the warm weather hits but for now I love how peaceful and quiet they are. Some days we have been the only ones down there. We’ve started to explore the local cafes and restaurants and I can’t wait to share our finds with you. There are also some nice parks nearby, including Hove Park which is actually pretty big! We were definitely spoilt with the park where we previously lived but the ones here are good too. Brighton isn’t that far either, a short bus ride away or about a 30/40 minute walk which I’ve actually done a few times now. I still can’t believe we are living down here but living near the sea is definitely agreeing with us so far.